In the wood warbler family, the IUCN lists seven as Near Threatened, seven as Vulnerable (including one conebill), five as Endangered, and three as Critically Endangered species. Of the Critically Endangered, two are feared to already be Extinct. They are the Semper's warbler (Leu-copeza semperi) of the mountains of St. Lucia in the West Indies, and Bachman's warbler (Vermivora bachmanii), a once abundant North American breeding bird that wintered in West Indies' forests. As might be expected, the remaining at-risk species are typified by small ranges, where even small habitat destruction can be disastrous. Of the at-risk species, many breed in North America, including one Near Threatened, five Vulnerable, three Endangered, and two Critically Endangered species. Vulnerable species include: Pirre warbler (Basileuterus ig-notus), elfin-wood warbler (Dendroica angelae), Kirtland's warbler, pink-headed warbler (Ergaticus versicolor), Altamira yellowthroat (Geothlypis flavovelata), white-winged (ground) warbler (Xenoligea montana), and Tamarugo conebill (Coniro-strum tamarugense). 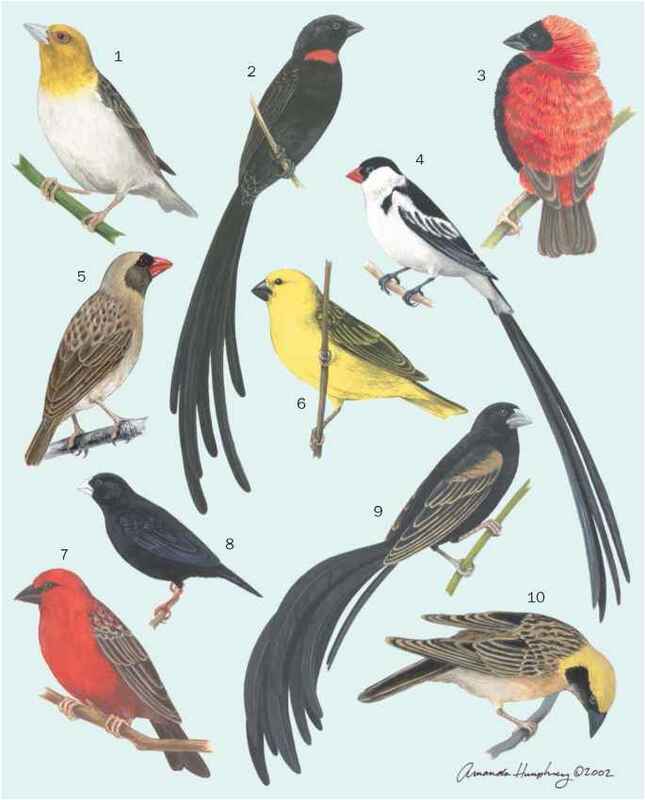 The Endangered species include: gray-headed warbler (Basileuterus griseiceps), whistling warbler (Catharopeza bishopi), golden-cheeked warbler (Dendroica chrysoparia), black-polled yellowthroat (Geothlypis speciosa), and Paria redstart (Myioborus pariae), which also goes by the common names of Paria whitestart and yellow-faced redstart. Besides the Semper's and Bachman's warblers, Belding's yellowthroat (Geothlypis beldingi) is Critically Endangered and faces extinction from the handful of small sites it occupies in the Baja California peninsula of Mexico. In addition to the at-risk species, scientists are also concerned about other songbirds, even those with more vast ranges. In the 1970s and 1980s, birders began to notice and report precipitous declines in populations of many common wood warblers, such as the cerulean warbler and the Kentucky warbler (Oporornis formosus), both of which breed in the central and eastern United States. The reports prompted research, which has since found the major culprit to be habitat destruction in the wintering grounds combined with habitat fragmentation in the breeding grounds. Many North American wood warblers share wintering grounds in Costa Rica, Guatemala, and other Neotropical and tropical countries that have undergone extensive deforestation, so scientists have taken a particularly close look at the relationship between habitat loss and songbird declines. A study of American redstarts, a black-and-orange bird that breeds in a swath across North America from western Canada south and east to the Atlantic coast of Canada and the United States, showed that the birds' success in the breeding season relied on the quantity and quality of their wintering habitat in Jamaica. With less habitat to go around, some redstarts wintered in lush, rich forests, while others were relegated to dry scrublands. Those in the rich forests found more food, faced less overall stress, and were in prime condition to leave on their spring migrations up to four weeks earlier than the less fortunate birds eking out a living in the scrublands. 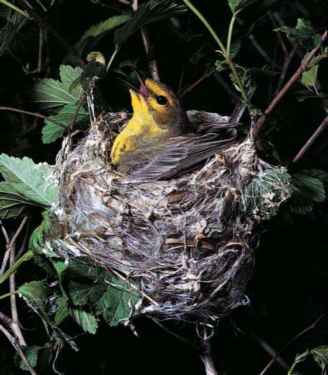 The earlier arrival in North America of the healthier warblers meant less competition for choice nesting sites and mates. feed whichever hatchling makes its mouth most available. The cowbird hatchlings become stronger and bigger, and those young warblers that avoid being crushed or simply pushed out of the nest by the cowbird hatchlings usually starve to death. Besides cowbirds, egg-eating raccoons and opossums also flourish in edge areas, and can devastate the warblers that nest on the ground. Many efforts are now under way to combat warbler declines, and several have been quite successful. The Kirtland's warbler is one example. Due to habitat restoration efforts, populations have risen in recent years, and the bird has been upgraded from its 1994 ranking as Endangered to a 1996 placement at Vulnerable, where it has remained.